FILE - In this Nov. 24, 2018 file photo, a demonstrator waves the French flag on a burning barricade on the Champs-Elysees avenue with the Arc de Triomphe in background, during a demonstration against the rise of fuel taxes. There are parallels for unpopular French President Emmanuel Macron in the demise of King Louis XVI more than two centuries ago. Democracy has replaced monarchy but the culture of a mob taking its anger against perceived inequality onto the streets of Paris has not changed. Really the French are in a predicament. They glorify the Revolution as an historical event. But by implication revolutionary activity then becomes a morally legitimate activity. In reality the French Revolution was both unnecessary and immoral, since the same result could have been achieved peacefully. But having glorified and celebrated the horrendous violence that the French Revolution unleashed upon the people of France and ultimately the rest of Europe, the French now have to live with the consequences. 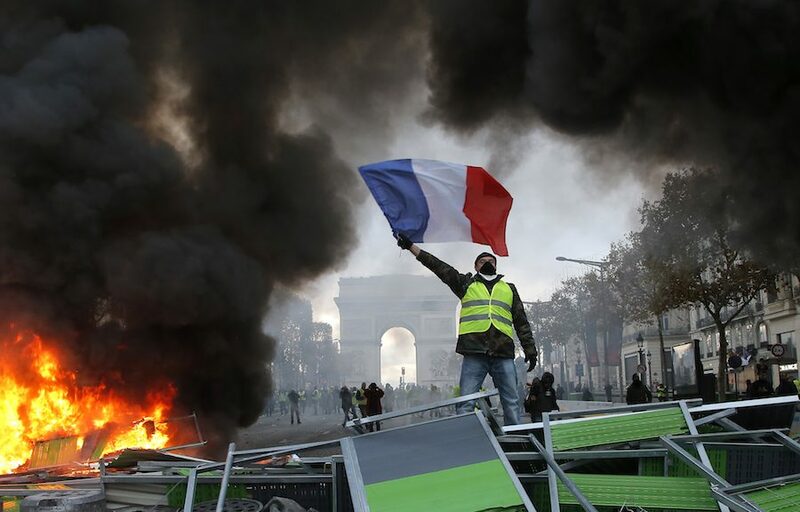 France under Macron is a tragic comedy…..the French elected a left wing socialist who simply fulfilled his promises to mitigate climate change by raising taxes on petroleum products to reduce green house gasses….one may expect his socialist upset with Macron decision to now embrace petroleum products and green house gasses by rolling back his commitment to reducing as reasons to take to the streets and riot. Last I saw he favorability rating was at 20%-ish whom have yet to take to the streets to riot (yet).